Built environment professionals considering whether to embark on the design and construction or retrofit of a fully ‘sustainable’ or ‘green’ build need to know the financial implications of their decisions. What are their financial options? What are the risks? 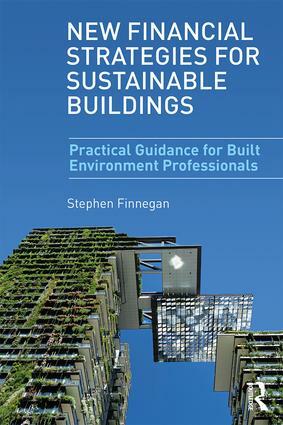 This book offers practical guidance on how sustainable building projects are financed, designed and built. All too often sustainable building is undertaken without proper consideration of the true lifecycle cost, risk and financial impact. This book will take the reader on a journey from initial sustainable design through to final completion highlighting the finance options available to them. New Financial Strategies for Sustainable Buildings provides key guidance to a variety of professionals, including architects, designers, contractors, construction managers, investors and other interested parties, whilst providing a useful reference to students on architecture, construction management and real estate/surveying courses who need to know about finance, construction economics, and sustainable development projects.